Crystal Clear epoxy is perfect for layup and coating applications showcasing a natural wood finish, as on wooden canoes and kayaks. Kits feature our Traditional Epoxy Resin paired with Crystal Clear hardener, and also include calibrated measuring pumps plus mixing tools. Size B (Gallon Kit) 127 fl. oz. 42.3 fl. oz. If you’re logging serious hours constructing a kayak, stripper canoe, or stitch-and-glue pram—and making it absolutely perfect in all its wood-grainy glory—don’t ruin all your hard work by finishing it wrong. Choose an epoxy/hardener combo that’ll really show off the natural beauty of your floating wooden wonder. 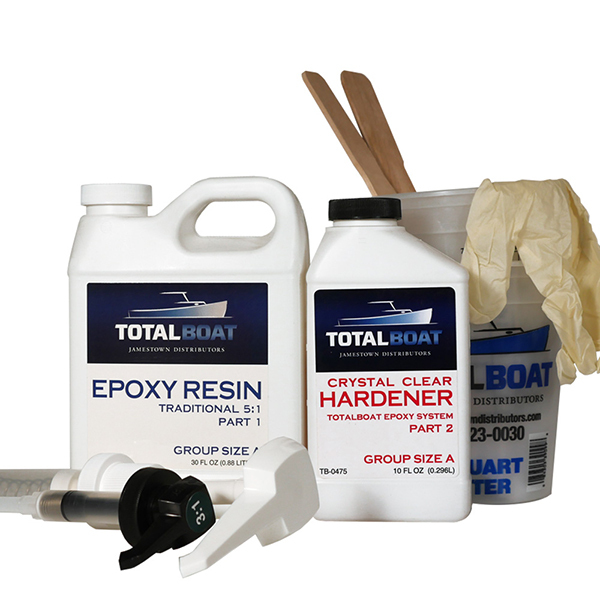 TotalBoat Crystal Clear Epoxy Kits are the clearest choice for making real wood look real good or showcasing the cool factor of carbon fiber fabrics. Each kit includes our traditional epoxy resin, Crystal Clear Hardener, measuring pumps, and mixing tools to make the job easier. For coating applications, this crystal clear formula flows out and self-levels to penetrate and seal the wood, which helps prevent rot and hairline cracks in the grain (aka checking). For layups, it wets out fiberglass and carbon fiber fabrics easily, requires less resin to fill the weave, and won’t turn cloudy or leave any messy blush to remove. It cures to a high-strength, moisture-resistant, exceptionally clear solid ready to finish with varnish or clear topcoats. A quality, UV-filtering varnish is good at protecting wood from sun damage, but by itself fails at keeping out moisture. It also has trouble adhering to wood that expands and contracts with seasonal changes in temperature and humidity. Eventually, the varnish will crack, look bad, and allow moisture and UV light to penetrate and do damage. Apply Crystal Clear Epoxy to brightwork before varnishing or clear coating. It creates an effective moisture barrier, won’t shrink when it cures, and provides a stable base for the varnish to cling to so it’s no longer at the mercy of shifty wood. It also contains UV inhibitors that boost the UV protection of varnish and clear topcoats so they look better and don’t need to be maintained as often. Applying 12 coats of varnish on brightwork is a monumental task that can easily take three weeks or more—and that’s IF the weather cooperates. For a shortcut that gives you the same look and UV protection, use Crystal Clear Epoxy instead of varnish for the buildup coats. You can get the buildup coats done in a single day, with 1 to 2 hours between coats. The next day, sand, wipe clean, and you’re ready to varnish. You’ll only need about three coats of a quality, UV-filtering varnish on top of the solid, Crystal Clear Epoxy base. Get the job done in less than a week. And because the epoxy enhances the protection of any UV-blocking varnish and provides a stable base for it, the finish will last longer before you have to do any maintenance on it. Less labor, less varnish, and less maintenance in the long run. More time to enjoy your beautiful boat. By Pumps: Use the TotalBoat Epoxy Pumps: white for the resin and black for the hardener; one pump of resin and one pump of hardener. These user-friendly, color-coded pumps meter the resin and hardener in the proper proportions. All you have to do is apply one full stroke of the hardener pump for every one full stroke of the resin pump. This ratio is preset and is required for a proper cure. After measuring, just give the mix a good stir for about two minutes to combine thoroughly before adding fillers or applying.